Earlier this year I was riding around Atlanta on a lunch hour with my client’s personal assistant, Rhoda. A sharp 30-ish Black woman with a self-possessed air, she had just finished telling me the quick rundown of her life—started a restaurant with her husband, grew it and then saw it decline as tastes changed—starting her life over in Atlanta after a divorce and a move. Now she’s caring for and worrying about her two teenage boys, one of whom had been diagnosed with ADHD. And she’s going to school to get her business degree. She’s gotten her massage therapy license but she doesn’t want to just be a therapist—she and her new husband want to open and run a wellness clinic. She’s put a lot on her plate, and some days it’s more than she can manage. “I hate feminists,” she said. What? “Tell me about that,” I said. It’s more than she can handle: holding down a job, working toward her goals, and keeping her kids out of trouble. She blames us. She blames me, but she doesn’t know it. And I feel bad for her. We did let her down. We marched out of the kitchens and nurseries and nobody marched in to take our place. 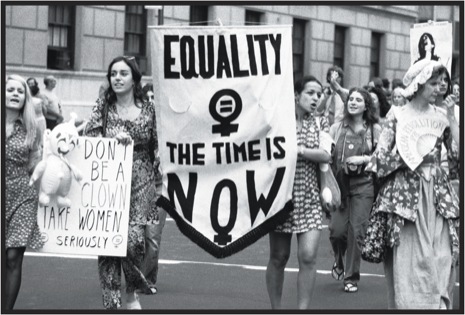 “They” let us feminists down—the public that was supposed to pass the Equal Rights Ammendment, then universal childcare, and then some basic level of universal health care so that women could have the option of going to work, just as joyfully or grumpily as the men, without leaving the job of nurturing the homefront uncovered. The problem is, we can’t just go home and get back to work on being moms. Even most two-parent households can’t afford to get by on only one income. And so, our nation hobbles along on a jury-rigged system. Grandparents are raising grandchildren in rates that are through the roof. After-school programs are crammed with children warehoused until their parents come home. The lack of strong male role models is driving a life cycle of poverty for too many young men. They don’t see a positive example, and if you can’t see it, you can’t be it. This is my apology to all the Rhodas. I apologize for the untenable position you find yourself in—having to work, and still parent your kids, and somehow find time to find a way to make it better tomorrow. Back in the Second Wave my sisters and I expected a collective solution to this problem, if not a societally mandated one. None of us envisioned the legions of Rhodas, isolated and angry with us for what we failed to win. I’d like Rhoda to recognize that she would likely not have become a business owner—or be planning to start a second business—if it weren’t for what some of us did back in our day. But I don’t expect her to thank us. That’s too much to ask from somebody who’s running like crazy just to stay in place. Gosh, Sarah, this is so true. We need to start what we’ve finished. And I think the babyboomers, aka “women of a certain age” are just the ones to do it. As soon as you retire, start thinking about how to make this happen. We’ve probably got a good 20 years or more to make a difference.